Damavand is one of the highest freestanding mountains in the world and is described by a prominent beauty. Damāvand is pinnacle and landmark of Iran. Mountain tourism is increasing rapidly in this region. It is situated 70 kilometres from seacoast of Caspian Sea and about 80 kilometres driving distance from Teheran. The capital Teheran has 8 million inhabitants and about 15 million in the wider metropolitan area. Due to its great height, beautiful scenery, conical shape, interesting geology and wildlife and mild slops, Damavand is an excellent destination for hiking & trekking for climbers from Iran and allover the world. It is registered as a national natural heritage and there are discussions to registered it as a UNESCO international natural heritage. Visit Damavand Tour. Mount Damavand has about 16 known routes to the peak with different difficulties. Some of them are dangerous and require rock climbing techniques. The most popular route is the classic Southern Route with good footsteps and a midway campsite called Bargah Sevom at 4220 masl (13,845 feet). In the summer season and when Damavand Weather is good enough this route is moderate, but it needs a good physical ftness and sufficient acclimatization.The major difficulty is when the wind is not in the favorite direction and the sulfur gas near the summit come towards you making breathing difficult. More in Damavand Difficulty. Damavand is the symbol of Iranian opposition against dictatorship and foreign rule. The mountain is in the heart of Persian myths and has a special place in Iranian legend, poetry and literature. In the ancient Persian Zoroastrian religion scripts and myth, the three-headed dragon Aži Dahāka was chained in Mount Damāwand to remain there forever. In another version of the same legend, the tyrant Zahhāk after defeat was also put in prison in a cave somewhere in the mountain. More in Wikipedia. Persia is one of the most mountainous countries in the world. Iran`s scenery is dominated by rocky mountains divided by different ranges. Variety of wild landscapes and mountains allover the country. The main mountain chains are the Alborz and Zagros Mountain Ranges. Visit also Damavand Vip Tour, Damavand Economy Tour and Damavand Ski Touring. 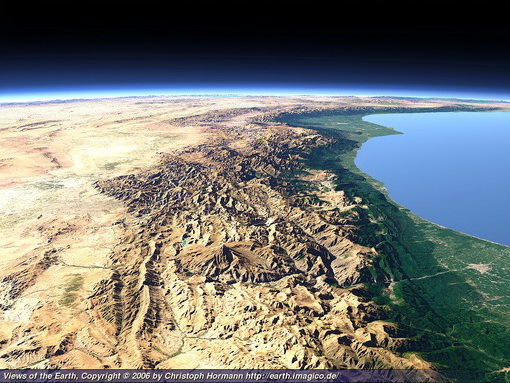 Alborz Mountain Range (also Alburz, Elborz, Elburz) is in northern Iran and extend from the northwest to northeast. It stretch from Azerbaijan Province along the southern coast of the Caspian Sea and merge into the Aladagh Mountains in Khorasan Province. Alborz Mountain Chain is about 1500 km long and its width varies from 30 to 130 km, avarage height is approx 3000m, with several peaks over 4000m. Persian name, البرز یا رشته کوه البرز . Read more in Damavand Forum and Iran Mountain Federation. 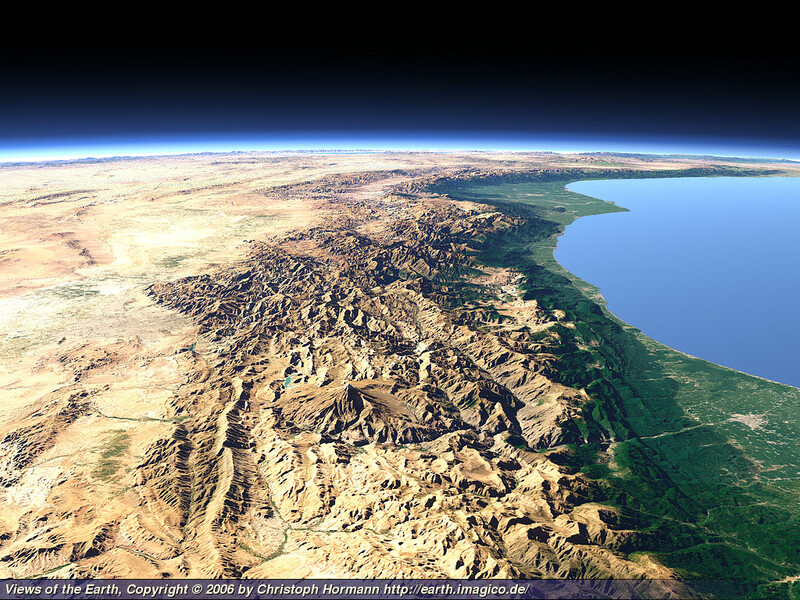 Nice Image by Views of the Earth. Alburz Mountains is divided into Western, Central and Eastern Alborz Mountains. The Western Alborz Range is called Talish Mountains. The highest mountain in this mountain range is called Mount Damavand. It is standing in the central part of the Alborz Mountains. Alurz almost run from Transcaucasia or the South (Lesser) Caucasus in Armenia and finally goes near minor ranges in Hindu Kush in western Afghanistan. [Lesser Caucasus runs parallel to the Greater Caucasus (connected to the Greater Caucasus by the Likhi Range) and Hindu Kush is a subrange of the Himalayan range]. The elevation of Damāvand Volcano is 5,671 above sea level. Coordinates are 35° 57′ 20″ North, 52° 06′ 36″ East. Its of topographic prominence is 4,667 meters (15,312 feet) and is ranked number 12th in the world by topographic prominence. Damavand is the Highest Volcano in Asia and officially Damavand is in Volcanic Seven Summits (V7S). Also it is the highest mountain in Iran and the Middle East and on the Eurasian landmass west of the Hindu Kush. 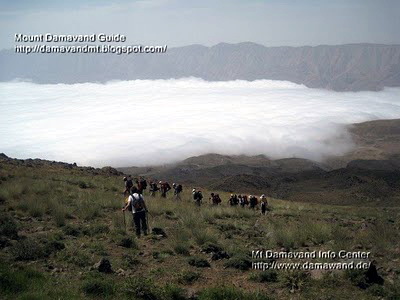 Damavand Info and Mount Damavand Guide. Main source of information for hikking & trekking and ski touring to Mount Damavand Iran. Guided tour & Alpine style mountaineering to Iran mountains. Tour operator to Alborz and Zagross Ranges. Ski mountaineering and ski touring with iranian local guides. Snowboard tour to Iran ski resorts. VIP tour for foreign climbers to Alborz & Zagros Mountains. Tour operator Tehran. with Services and logistics to support mountain tourism and incoming tours to Iran. Qualified teams Sharing experience to give you the best chance of success to Damawand summit. Mountain climbing tourism information center for Mount Alam kouh, Mt Dena and Volcano Sabalan Iran. Safe climbs to the Iran summits. information for Iran sightseeing tours. Iran outdoor tour operator. Sightseeing and outdoor activity tours Persia. Travel guide Iran. Desert trekking tours. Iran adventure travel tour. All the material on this website is protected by copyright. All Rights Reserved. © Damavand Hike.